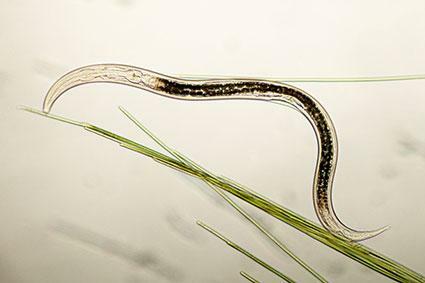 Nematodes are a group of tiny parasitic worms that prey on plants, insects, bacteria, fungi, and other organisms. They play important roles in the ecological structure of the soil and are usually only a concern to gardeners when the types that damage the root systems of certain plants begin to multiply. Nematodes are among the most abundant of microscopic species living in the soil and they are common in all areas of the United States. They are invisible to the naked eye, appearing as tube-shaped worms under a microscope. Many nematode species attack other pests and can be considered beneficial insects that are naturally abundant in a healthy garden ecosystem. However, certain species of nematodes can cause serious damage to the garden and are not easily controlled. When nematodes attack the roots of a plant, the aboveground effects are readily apparent - the plants appear stunted, with their leaves becoming yellow and wilted. This resembles the symptoms of many other pests, as well as a variety of nutrient deficiency problems, so it's also important to examine the roots. When you pull up the roots, look for signs of deformity. The most common type of nematode, called root knot nematodes, cause swollen protuberances all over the root system. Other types of nematodes may cause the roots to have sunken lesions in places or to appear unusually short and stubby. Since you can't see nematodes it's very difficult to confirm with certainty that they are the culprit when a plant is suffering, much less to identify the species of nematode that is present. Even if the roots show the characteristic symptoms, there are other pests that cause similar deformations. Thus the only way to know for certain is to send a soil sample to a specialized nematode diagnostic lab. The University of Florida houses one such lab that accepts soil samples from any state in the country and analyzes them for a small fee. Chemical nematicides are restricted substances that are available only to professional growers. However, for the home garden there are several all-natural approaches that can help to limit nematode populations once they are confirmed as the source of poor plant health. Solarizing the soil involves covering the area of soil where nematodes are thought to be present with a sheet of clear plastic, causing the soil temperature to rise to a level that kills the pests. Till the soil first for best results and leave the plastic in place for at least four to six weeks before replanting. Some plants that are highly susceptible to nematodes, which includes many root crops, have been bred for increased nematode resistance. When shopping for seeds and starts, check for the words 'nematode resistant' or 'nematode tolerant' on the label. Bionematicide products reduce nematode populations by introducing their natural predators to the soil. Healthy soil has a natural balance of beneficial nematodes and other microorganisms that keep the harmful nematodes in check. Annual additions of compost and maintaining a layer of mulch over the soil are two of the best ways to improve soil quality. Mix up an organic pest control recipe that is meant to combat nematodes. A mixture of molasses and water can be sprayed on the soil every few days to help keep nematodes at bay. Just the idea of nematodes in the garden may give you the creepy-crawlies, but remember that for the most part, they are there to perform important ecological functions -- and you can't see them anyway. But if you do suspect that one of the harmful nematodes is causing your plants to wilt, take a soil sample to confirm their presence first and then try one or more of the available remedies to see what works for you.